The Upper Blackfoot Mining Complex (UBMC) encompasses 6 square miles of historic mining areas at the headwaters of the Blackfoot River. 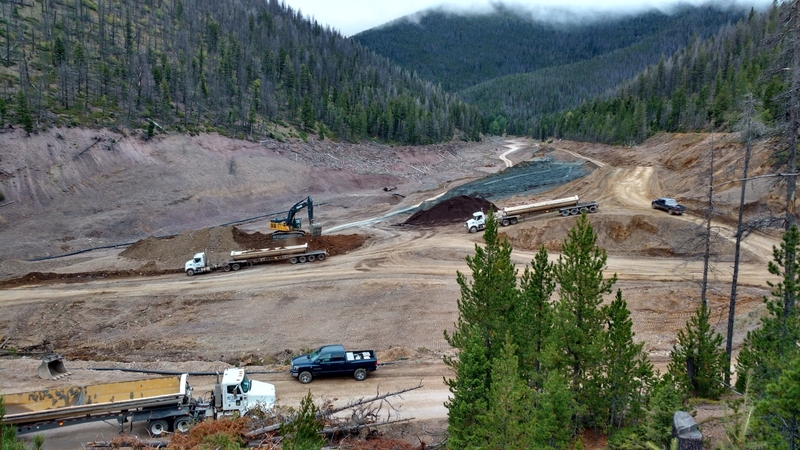 This project involves remediating a large expanse of mine-impacted soils and floodplain wastes caused by a massive dam break in the mid-1970s, placing the wastes in a mine waste repository, and restoring the Upper Blackfoot River, Beartrap Creek, and Upper Mike Horse Creek. Pioneer provides engineering and environmental remediation services to the Montana Department of Environmental Quality (DEQ), Natural Resource Damage Program (NRDP) and other agencies under the watershed restoration agreement. Pioneer is the Engineer of Record of this multifaceted project. The work is wrapping up in 2018. Work in the Mike Horse, Upper Beartrap Creek drainages, and water treatment plant upgrades were complete in October 2016, and work on the Blackfoot River began in spring 2017. 10/22/2018. Montana DEQ showcases cleanup at Mike Horse Mine. “The lay of the land has changed tremendously,” said DEQ project manager David Bowers. “The streams, the floodplains that have been reconstructed are so different than what was up there before.” Read and see the video here. 8/2017: Additional information about the previous work is here. Award: The Montana Contractors’ Association presented an Environmental Excellence awards to this project (2016). The UBMC Phase 2 project won the Special Recognition – Water Quality award. Details on the project. Elevated levels of metals in soil, sediment, groundwater, and surface water. 10 tributary streams to the Blackfoot River. More than 250 mining-related features throughout the site, including waste rock dumps, collapsed adits, subsidences, exploration pits, and discharging adits. Steep, rugged, and forested terrain with difficult access and elevations between 5,200 and 7,200 feet, and short construction seasons. Highly mineralized areas with the ore-body at or near the surface at multiple locations, and active adit discharges. Multiple landowners: U.S. Forest Service, Montana Department of Environmental Quality, and private owners. Previous reclamation/remedial actions at the site included removals, construction of 3 repositories and an active water treatment plant to treat contaminated groundwater from the Anaconda and Mike Horse mine sites. Groundwater contamination at the Carbonate mine site required evaluation of innovative treatment and source separation methods. 136-acres of impacted wetlands (marsh) areas within the Blackfoot River floodplain. 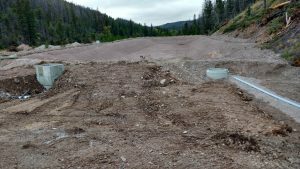 Marsh areas contained several thousand cubic yards of tailings and impacted sediments from upstream tailings impoundment failure. Feasibility and design level geotechnical investigations consisting of geological mapping, logging and sampling test pits and boreholes, and geophysical analyses. Existing tailing dam evaluation that resulted in the design/installation of new, temporary outlet conduit and emergency bypass channel. Extensive geotechnical laboratory testing: triaxial strength, permeability, Atterberg limits, and particle size analysis. Repository design and stability modeling. Stream channel slope design stability modeling. Geosynthetic membranes, geogrid, and geotextile applications in the design. Aggregate and asphalt surfaced haul road design. Deep foundation and retaining wall design for single span vehicular bridge. Quality control field density testing and materials laboratory testing for Contractors. Prepares the bid packages for waste removals, stream and floodplain reconstruction, and repository construction. Provides general oversight and coordinates all design and construction activities. Completes detailed design and engineering for all site-wide aspects of the project and the repository. Coordinates with the other design team members to combine reclamation, stream restoration, and revegetation phases into a single coordinated construction bid package. The Montana Environmental Trust Group (METG) is showcasing the Mike Horse project on their site here.